Pete Seeger will be honored with a star-studded 90th-birthday concert Sunday at Madison Square Garden. The pre-party, though, happens Saturday night in White Plains. Tribes Hill musicians Anthony da Costa, Matt Turk, Fred Gillen Jr., KJ Denhert, Kathleen Pemble and Steve Kirkman will be performing each other's songs and joining together for sing-alongs. The folk-music legend's not on the bill, but Seeger has long been a "distinguished member" of Tribes Hill, says Tribes Hill founder and director Rick Rock of Valhalla. Seeger's spirit is part of all the nonprofit group does. "We were influenced largely by Pete's work and that whole folk process of sharing songs," says Rock. The concert was initially planned to mark the impending release of the "Tribes Hill Songbook," literally a songbook that will encourage both music education and appreciation. That the show coincides with the mega-event in Manhattan - and Seeger's actual 90th birthday on Sunday - is just a case of lucky timing. "I have a feeling that the universe takes control of certain things," Rock says with a laugh. Turk, a singer-songwriter who lives in Hastings-on-Hudson, says the new songbook could end up in homes throughout the region. "They could pull out their Elton John songbook, but they could also pull out their Tribes Hill songbook," he says. There's no release date yet for the book, to be dedicated to longtime Hudson Valley resident Seeger, but excerpts will be featured on the Tribes Hill Web site in coming months. For now, audiences can simply listen to the performances Saturday. Tribes Hill has made quite an impact beyond its local start, says John Platt of WFUV 90.7 FM. It now features more than 100 official Hudson Valley members, but extends to a larger community. "What's happened, I think, in a way, is it's spun out from Westchester," Platt says. "It has created this rippled effect throughout the metropolitan area." Platt, host of WFUV's folk-oriented "Sunday Breakfast" show, says it's an interesting time for singer-songwriters. "To use the dreaded words, there's been a paradigm shift," Platt says. "One the one hand, it's more challenging because the economy's contracting now ... and yet, there's an incredible grass-roots movement." Music, he says, is cheaper to produce and get out to an audience - and musicians like the members of Tribes Hill are connecting in all kinds of ways. "I think there's a feeling among the people who are passionate about this music that I think you want to share," Platt says. "We use the word community very consciously at WFUV. We know we're supported by a community of music lovers. I think Tribes Hill has really been a role model for creating a community of musicians." That community, he adds, reflects "a shared commitment for making great music for the sake of making great music ... not that they don't want to make a living, of course." Tribes Hill, Platt adds, is a vibrant part of the folk tradition. "It's not that they're doing anything that's brand new, but they're walking the walk as well as talking the talk," Platt says. And singing the song, says Turk. Sometimes, Turk says, Tribes Hill members are struck by what other members are doing. Those songs are the ones to be featured this weekend. "The song comes across the first time you hear it," he says. "The message is clear. The melody is great." Turk says while there are some "older gems," most of the songs performed will reflect the artists' more recent work. The show will feature two sets, with solo performances followed by set-ending collaborations. "As more and more of the artists started learning each other's songs, we thought: 'Wow. This is really cool,' " Rock says. "It created a different perspective on a song." It's like the way, he says, that KJ Denhert will do a Beatles song - "It's a whole new sound to it," he says. That's what he hopes will happen in this performance. "I really want the artist to find a song that's written by somebody else that they can spin in their own special way," Rock says. Anthony da Costa of Pleasantville is an 18-year-old singer-songwriter soon to graduate from Pleasantville High School and attend Columbia University. He has been affiliated with Tribes Hill for four-and-a-half years - getting musical advice, business tips and building ties to other musicians - and says he's looking forward to the group show in White Plains. "The coolest thing about Tribes Hill and the reason I think this will be really special is the group is all about community," da Costa says. "It's setting a great example of that." Da Costa says he expects to sing "a song or two by Fred Gillen Jr.," whom he calls both friend and mentor, along with something by Steve Kirkman, also a mentor. "It's songs none of us were forced to learn," da Costa says. "It's kind of like the whole torchbearer kind of thing." The evening, he adds, will also reflect the very nature of Tribes Hill - and the way they work together. "We're all kind of used to jamming," da Costa says. "A lot of the playing I've done with these guys is at festivals, late-night bonfires." There is, he adds, a "natural chemistry. ... We trust each other." And they also have fun together - the performers agree that a few Seeger songs are likely to pop up during those finales. "These guys, Pete especially, encouraged us to get everybody singing along and get songs that people can sing along to," Turk says. And from these songs, who knows where it all will lead, he adds. "When we can sing together, we're doing that together - and we can do anything together." Anthony da Costa - This 18-year-old Pleasantville resident is juggling the end of high school, a concert schedule and work on a new release. "Not Afraid of Nothing," the working title, is being produced by John Elliott (The Hereafter) and is being recorded primarily on da Costa's laptop. For more, visit www.anthonydacosta.com. Fred Gillen Jr. - This singer-songwriter and multi-instrumentalist's Croton-on-Hudson studio is a mainstay of the local scene. Gillen rose to fame as a member of the Rain Deputies and released his first solo CD, "Intentions as Big as the Sky," in 1997. Often performs Gillen & Turk, a folk-rock group, with Matt Turk. For more, visit www.fredgillenjr.com. Matt Turk - Turk is the other half of Gillen & Turk with Fred Gillen Jr. Also a singer-songwriter and multi-instrumentalist, Turk has been working in Los Angeles with producers Dan Pinnella and David Dobkin (who also directed "Wedding Crashers") on a solo release set for the end of summer. Gillen & Turk will tour the Southeast later this month, returning to the area for festivals including the Clearwater concert in June and the Gathering of the Vibes Great Clearwater in June and the Gathering of the Vibes in Bridgeport, Conn., in July. For more, visit www.turktunes.com. Kathleen Pemble - Winner of The New York City Song Slam, Pemble's a singer-songwriter who's played on stages ranging from The Knitting Factory in Manhattan to the Peekskill Coffeehouse. For more, visit www.kathleenpemble.com. KJ Denhert - This singer-songwriter and guitarist calls her music "urban folk and jazz." Self-taught, she points to James Taylor and Joni Mitchell as her main influences and has toured the world. For more, visit www.kjdenhert.com. Steve Kirkman - The singer-songwriter known as the "roads scholar" traces his roots back to North Carolina, but spent years in Nashville, Memphis and most every other part of the country before joining the Hudson Valley music scene with a move to Putnam County. For more, visit www.stevekirkman.com. 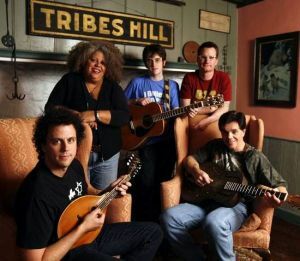 What: "Tribes Hill Songbook" Concert. Where: The Arts Exchange, 31 Mamaroneck Ave., White Plains. Admission: $30 for reserved seats, $15 for general admission and $10 for children, students, senior citizens and ArtsWestchester members. (Day-of-show tickets will be an additional $5). Information: 914-428-4220; www.artswestchester.org; or www.tribeshill.com. Note: Tune in to John Platt's "Sunday Breakfast" show, from 8 to 11 a.m. this Sunday on WFUV-90.7 FM, for his own tribute to Pete Seeger.